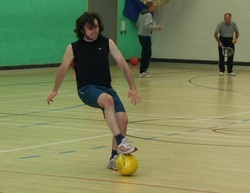 Football for totally blind participants is played with an audible ball and a fully sighted goalkeeper. Football for the partially sighted is played with a high visibility ball with a partially sighted goalkeeper. Sides consist of five players. This sport is recognised in the paralympics. There is also a national league and SAVI already have established links with this. Please see the video below of the IBSA World Football Championships Final 2010.